Thank you Walton parents, family, students and community! You helped us surpass our goal of raising $12,000 so that our school library can continue to provide fun, interesting, and educational (...ssh!) resources to help our minds explore and expand. Here's some information about what we did to raise the money, and what the funds will go towards. 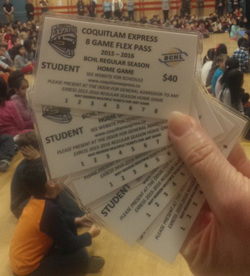 Have a few extra bucks to give? You can still donate. With this new funding, over the next 4 years, the library will be able to purchase approximately 985 new books, and keep 200 existing books in circulation. The 550 Walton students read 15 minutes a day from Jan 4th to 31st. A great assortment of books were completed like The Tales of the Beedle Bard, The Chronicles of Narnia, Star Wars and Pinkalicious Pinkie Promise. Well done! The Walton Reading Tree was tended to by Ms. Augustyn. Each leaf represents a book read by a student. 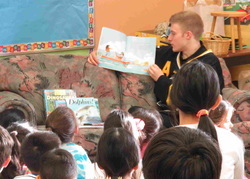 The WHL Coquitlam Junior A team, the Coquitlam Express visited the school and read to every classroom, and played hockey against the grade 4's. Walton Read-a-thon from Jen Sing on Vimeo. A few of the students helped me make this fun video to tell people about our fundraiser. Walton Read-a-Thon from Chimp on Vimeo. Craig Mah, the school principal, volunteered to have his head shaved if we reached our fundraising target. Read about our fundraising effort. Please complete the brief survey to help us understand how to fundraise better in the future. Thank you everybody for making the 2016 Walton Read-a-thon a Success!